The end of other companies may prove key to the life of your own. The graveyard might be the last place on Earth you’d care to visit, but, if you don’t want your company to go under, it’s a good idea to pay attention to what killed other similar companies. Of course projects have unhappy endings. Call them failures if you will. But if you believe in process, take the long view of life, and have the courage to look at startup corpses – then the stories of failures become instructional lessons more so than sad tales. We tend to bury defeats inside of ourselves where they can only go on hurting. By burying dead startups in the open, everyone can learn and move on faster. 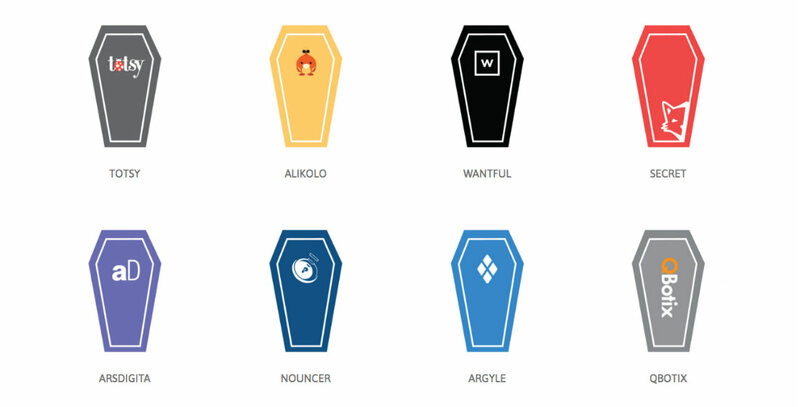 Startup Graveyard lets visitors view the departed collectively or by category. The later arrangement is helpful to Founders because it allows them to investigate how companies in the same space met their demise. And to that end, Startup Graveyard lists the reasons for a company’s failure (We have our list as well when it comes to why startups fail). Each profile also details basic company information – location, purpose of the company, Founders, financial backing, etc. – notes competitors, and opens room for commentary. The space is new, and the “undertakers” are quick to point out that their portrayal of each death may not account for all the factors. In other words, they may not have all the details. Each page is currently more shrine than thorough autopsy. As the website evolves, it would be great if Founders were willing to contribute more data. Not only would, say, even doing so little as providing a quote, add insight, it would invite more discussion and advance the website’s mission of creating community. After all, though their efforts and accomplishments often make them seem superhuman, Founders, too, are social creatures, still genuine flesh and blood people. Pay your respects and learn from others’ mistakes at startupgraveyard.io. Keith Liles is a freelance writer who loves travel, music, wine, hiking, poetry, and just about everything. He practices saying “yes” to life vigorously, rehearsing for the phone call when he’s asked to tour with Bruce Springsteen and the E Street Band. Follow Keith on Twitter @KPLiles.